The 2017 Toyota RAV4 continues to be a popular choice among our Santa Ana and Culver City customers, and it’s about to become even more demanded after drivers read the critics reviews. Top auto industry reviews have nothing but positive acclaim for the 2017 RAV4 because of its well-appointed design, roomy interior, and advanced safety feature offering. Keep reading to see what some of these reviews have to say. The reviewers over at Kelley Blue Book (KBB) took notice right away of the exterior of the 2017 Toyota RAV4, “Overall, we like the looks of the 2017 RAV4 compact-crossover SUV, and its sharp lines are positively aggressive.” A recent improvement to the exterior of the new RAV4 was the removal of the rear-mounted spare tire. This has been a signature feature of the RAV4 since its inception, but it was found to be impractical and made it hard to load the vehicle. The new design is sleek and modern and upper level trims offer a power assist tailgate to further increase the ease of loading and unloading. Toyota not only took time to upgrade the exterior of the 2017 RAV4, but they also upgraded the interior with higher quality materials and soft-touch surfaces. The Car Connection praised the RAV4 saying, “Some big upgrades last year improved the RAV4’s interior, and it remains particularly well-packaged for real-world use.” In addition, they enjoyed the new premium Platinum trim that has high-end features like a heated steering wheel and an 8-way power-adjustable driver’s seat with memory function, and they appreciated the cavernous trunk space that goes from 38.4 to 73.4 cubic feet with the split-folding rear seat folded. As safety is a top priority for our Santa Ana and Culver City customers, it should be noted that each trim for the 2017 Toyota RAV4 now comes with the Toyota Safety Sense collection of driver assistance technologies. And Edmunds.com gave the 2017 RAV4 a rave review for this very fact because safety should always be put first. 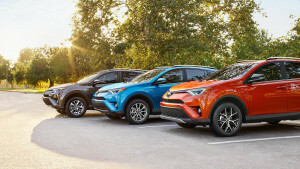 You’ll find that each RAV4 comes with advanced safety features including Pre-Collision System with Pedestrian Detection (PCS w/PD), Lane Departure Alert with Steering Assist (LDA w/SA), Automatic High Beams (AHB), and Dynamic Radar Cruise Control (DRCC). It’s time to make your own review of the 2017 Toyota RAV4 by coming down to Marina del Rey Toyota to take it for a test drive. We’re sure you’ll have a similar experience to that of the experts, so make sure you stop by today to take this highly celebrated crossover out for a spin!